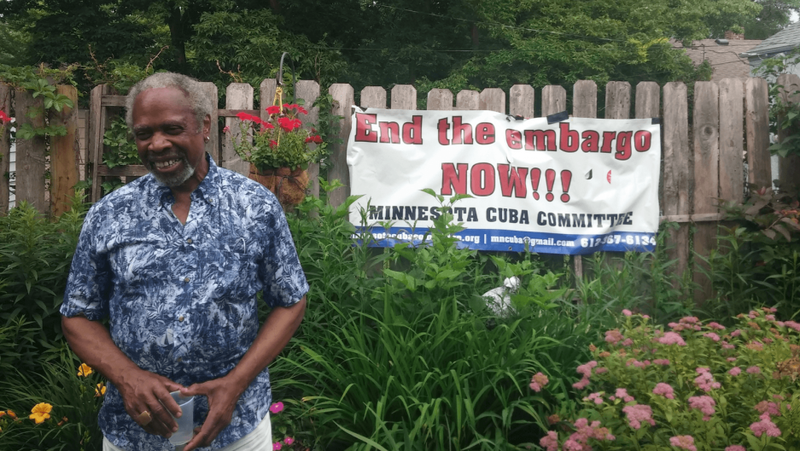 In the backyard garden of a modest home on the east side of St. Paul, Minnesota, two dozen people drink mojitos and chat on a humid Sunday afternoon. One woman dons a shirt emblazoned with Che Guevara’s image. Another man wears a shirt advertising Havana Club rum. A banner reading “End the Blockade Now” drapes the backyard fence. Below it, in smaller words, is the name of the activist group meeting here: the Minnesota Cuba Committee. People move inside to the basement to watch a documentary about a medical school in Cuba that trains aspiring doctors from around the world free of charge. One of the speakers featured in the documentary, Gail Walker, traveled from New York to be here this afternoon as a stop along her Midwest route to raise money for a humanitarian caravan to Cuba later this year.